Lafayette City/Parish administrative offices are located at 704 West University Avenue, Lafayette, LA 70506; phone: 337-291-8200. Photo: Charles H. Mouton House (Shady Oaks), ca. 1848, 338 N. Sterling St., Lafayette, LA. Listed on the National Register of Historic Places in 1980. Photographed by User:Tjean314 (own work), 2012, [cc-by-3.0 (creativecommons.org/licenses/by/3.0)], via Wikimedia Commons, accessed October, 2012. Lafayette, the seat of Lafayette Parish, is the commercial center for a rich mineral and agricultural district in south-central Louisiana. Cane, rice, cotton, corn, and sweet potatoes are grown in the vicinity; salt, sulphur and oil deposits are present nearby; cattle raising and dairying are becoming increasingly important; industries include sugar refining, cotton ginning, canning and syrup manufacturing. On the main line of the Southern Pacific Railroad, Lafayette contains railroad division offices and repair shops, while the 19-mile-distant Inter-coastal Waterway provides cheap water transportation. 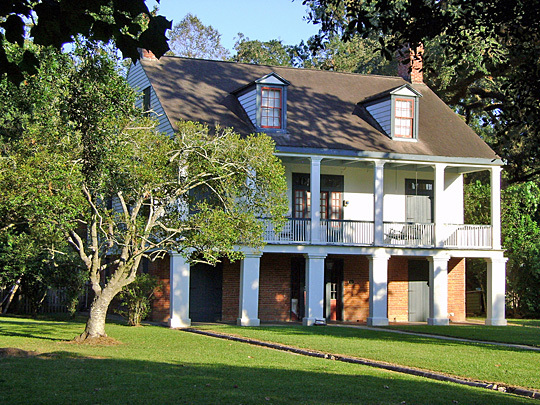 Lafayette originated as a plantation settlement about the time of the American Revolution, in a region once inhabited by the fearful Attakapa. Probably the first families to clear the present town site were those of Andrew Martin and the brothers Jean and Marin Mouton, who reached the place during the 1770s. Salvator and Anne (Bastoroche) Mouton came from Halifax, Nova Scotia, with the young Jean. Marin was born in Louisiana. According to George W. Cable's version, Anne, fleeing the English persecution in Nova Scotia with her children, took refuge in a forest and subsisted for 10 days on roots and berries before making her escape. Like the Moutons, other early colonists were almost exclusively French, many of the sons and daughters of exiled Acadians. They first named the village Vermilionville, after nearby Bayou Vermilion. The first written word of the settlement is found in the report of the missionary, Pere Michael Bernard Barriere, who wrote in 1804 that he often stopped at "the large plantation of Jean Mouton," whom he further identified as "l'oncle dit chapeau" (the uncle known by his hat). Two branches of the Mouton family have long been differentiated as the "Chapeau (hat) Moutons," the descendants of Jean, and "Capuchon (colloquial French for 'cap') Moutons," the descendants of Marin—a result of one brother's habit of wearing a hat, the other a homespun cap. The Mouton family has produced many men prominent in Louisiana history. Alexandre, Jean's son, was a U. S. Senator, the first Democratic Governor of Louisiana, and the presiding officer of the secession convention. Vermilionville, as the settlement was first called, was laid out as the seat of Lafayette Parish in 1824 by Jean Mouton, who donated land for the courthouse and the Catholic church. It was incorporated in 1836 and about 1840 acquired a branch of the Union Bank of Louisiana. In 1842 Vermilionville Academy was established, to continue until 1872, when it was sold and the proceeds used for free public schools. By 1846, a weekly newspaper, L'Impartial, was being published in both French and English. Early activity in this section was centered around cattle raising, jeopardized just before the Civil War by a highly organized band of cattle thieves. Ruin threatened the Acadian ranchers when the rustlers grew so bold they began to corral entire herds in daylight, under the very eyes of their owners. The bandits were largely "foreigners" who had drifter into the region to find "pickings" good among the easy-going Acadians. Numbered among then were wild young sons of good Acadian families, attracted by easy money and adventure. Obtaining little satisfaction from law enforcement agencies, the cattle raisers finally organized a force of 4,000 vigilantes under the leadership of Major Orilian St. Julien and Alfred Mouton, a West Point graduate. The rustlers formed an organization of "anti-vigilantes." In September 1859, after several minor skirmishes, the "antis" took refuge at an ammunition cache on a farm on Bayou Queue de Tortue. The vigilantes, pursuing them, dragged up a formidable looking cannon, in the face of which the bandits took flight. Some 200 of them were captured, the leaders hanged, and the others flogged until they agreed to leave the State. The local youths were let off with lashings and promises of reform. Barde's Historie des Comites de Vigilance au Attakapas offers an interesting account of the incident. Retarded by two yellow fever epidemics and Civil War engagements, Vermilionville remained little more than a village, with its trade concentrated in the hands of a few Jewish merchants, until the construction of the New Orleans, Opelousas and Great Western Railway in 1878, and its extension to Houston, Texas in 1881. In 1884 the name was changed to Lafayette.